Thank goodness for adorable, high-quality shows! I know adorable isn’t the best adjective to describe a show aimed at adults, but it was the first to pop into my head. “Call the Midwife” is my current obsession; I’m telling everyone I know, “You have to watch it!” I came across it randomly one day while flipping channels – there was some special (I’m guessing) about it on PBS, and it reminded me of Downton Abbey. I figured since I’m going through Downton-withdrawal, I may as well give this show a try, and thank goodness I did! The show is based on the memoirs of Jennifer Worth and set in 1950s London (already perfect, in my opinion. Favorite era, favorite city). It focuses on a young woman, Jenny Lee, who begins work as a midwife at Nonnatus House, a convent. She and the Sisters and other midwives service the slums of the East End, and throughout the episodes she comes in contact with many different people, and finds herself growing into a compassionate woman. Jenny is my favorite character; I feel like she and I are very similar. But believe me, it’s hard to choose one favorite. Every single person is so endearing. Aside from the characters, I absolutely love the clothing on this show! Everything is so classic and classy. I honestly believe that I was born in the wrong decade, and actually belong in the 1940s and 50s. The hair and makeup is beautiful, too – natural and simple. I’m constantly searching for tutorials, but haven’t found any yet! It’s a good thing my summer vacation is just getting started, because I would hate to be interrupted in watching Seasons 1 and 2; I’m already two episodes into Season 2 and can’t wait for Season 3 to begin! In the meantime, I guess I’ll just have to pass the time with reading the books. Things could be so much worse, couldn’t they? Have you seen Call the Midwife? What do you think? Who is your favorite character? 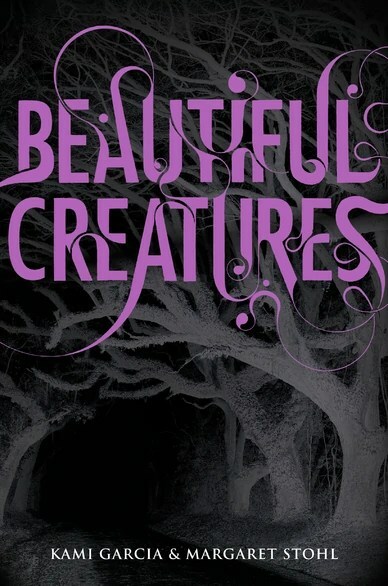 I finally made it through Beautiful Creatures over the weekend. 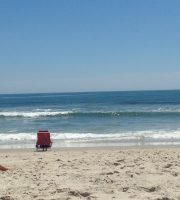 I knew it was going to be hot, so I decided to take a day-trip to the beach. I packed my beach bag with a few books since I was sure I’d finish Beautiful Creatures, and of course I’d need a new book to start. I thought I should wait a little to write a post about it because I wanted to make sure I had all my thoughts in line. Get ready. Sixteen-year-old Ethan Wate lives in the small Southern town of Gatlin. This is your stereotypical small town where everyone knows everyone’s business, and no one leaves. Ethan is anxious to get out after high school…but then Lena Duchannes comes to town and changes everything. Ethan realizes that Lena is the girl he has been dreaming about, and finds himself “drawn” to her. They develop a relationship despite the fact that Lena, the niece of the town recluse, is the outcast at Jackson High and everyone is set on tearing them apart. As they grow closer, Ethan realizes that Lena’s differences come from special powers. She is a Caster. Lena’s sixteenth birthday is approaching, which means she will be “claimed” – she will be chosen as a dark caster or a light caster for the rest of her life. Knowing that her mother was dark, Lena fears that she will be the same and is desperate to stop it. Ethan spends every possible moment helping Lena search for a way to save herself…until her birthday comes, and it may be too late. As you may remember, I had been struggling through the book and was not a very big fan. At all. I wouldn’t say I hated it, but it was far from even being considered for a favorites list. It’s an “eh” book. Like I said previously, I’m not sure if my opinion was swayed by the reviews I read on goodreads, but it didn’t take much to figure out why so many reviews were negative. A second thing that I didn’t like was that there was no apparent basis for Ethan and Lena’s falling in love. There seemed to be no development of feelings over time, no getting to know each other. You know, those things we normal people go through in real life. In Beautiful Creatures, Lena and Ethan are “drawn” to each other because of a dream they keep having. And when they finally meet, Ethan’s world changes forever. Please. PLEASE! And don’t even get me started on the ridiculous lines. I wish I had kept count of how many times I rolled my eyes and thought, “Oh my God.” I couldn’t help but think as I read this, that a number of my students were reading these books, or had read them, and now have in their heads that this is what love is like…at sixteen years old. Hate to say it, but you don’t get an electric shock when you kiss someone unless you’re holding a fork in a socket at the same time. Or just skip it and thank me. Okay, maybe I did hate this book. Can’t win ’em all. Delirium is a book that I’ve always looked at, but for one reason or another, never decided to read. It was one of those that was always in the back of my head – “I’ll have to read that one day,” until finally, after seeing a number of my students with it, I decided to go for it (I had also just finished creating a summer reading list for myself, made up entirely of YA books, and was eager to start). Delirium takes place in the present-day United States, with a couple of major differences. The most important is that the government and society believe love to be a disease which must be cured. Without love, the society is safe. As a person approaches their eighteenth birthday and nears high school graduation, they undergo a number of tests and evaluations. Some are meant to determine whether or not they will attend college after high school, or be placed in a basic job; another test helps determine which job the person will be placed into, and the final tests are to find suitable matches for each person. Once a person receives their approved matches, they choose one from the list and that becomes their life partner, but only after they have both undergone the procedure to be “cured” – to no longer feel love. Lena is approaching her eighteenth birthday and looking forward to her procedure, and starting her new life of normalcy and safety. She and her best friend Hana begin their summer after graduation just like every other summer, until Lena meets Alex, a security guard at the labs where her procedure will take place. This sets into motion a series of events which help her to realize that Hana isn’t quite the person she’s always known, and that maybe love isn’t worth curing. While some aspects of this book are somewhat predictable because of the dystopian setting (and very similar to aspects of other dystopian novels), the story is original enough that it made me want to keep reading. Lena as the narrator was very easy to connect with, and I’m sure teenage girls will feel the same. I liked how real the society felt, and how similar to our own it was. It didn’t take a lot of imagination (which isn’t always a bad thing) to visualize the town, the school, Lena’s neighborhood, etc., and I found myself more able to focus on what was going on rather than trying to keep minor details straight. I also thought that Lena’s inner conflicts were very relatable – growing up learning and believing a way of life, only to find through different experiences that maybe you don’t agree with those beliefs – but what is right? Bottom line, I really enjoyed this book and have since flown through the sequel, Pandemonium (review coming soon). It’s a great choice for anyone who enjoys dystopian fiction as well as romance. 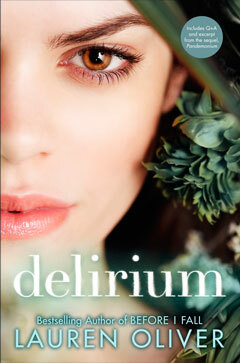 If you liked Matched, you’ll definitely like Delirium!